I know it’s still a few days until my birthday (June 18th!) 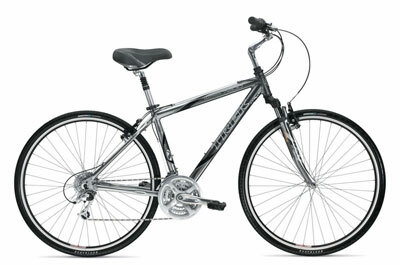 but Dana gave me my present already, a Trek 7200! My old bike is one I assembled from a dumpster in Madison about 14 years ago, so this is an amazing upgrade. I’ll miss riding “ol’ dumpy…” I mean, no I won’t, this bike is awesome! We’ve been trying to ride every day or so, and besides needing the exercise, it’s nice to get out and have some fun. Thanks Dana, I love you and the bike. Posted on Wednesday, June 14th, 2006 at 6:00 am. Subscribe to the comments feed. Both comments and pings are currently closed. Post on your own blog. Pete — I mean Raster — will you be taking your new ride off of a pier? I’ve actually ridden it on the boardwalk and onto a pier, but I’ll do everything in my power to keep from going into any bodies of water.